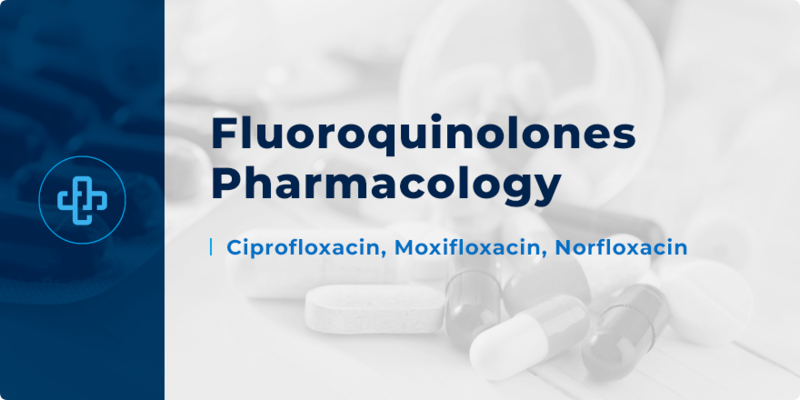 Fluoroquinolones Pharmacology | All the Facts in One Place! Quinolones have been around since the 1960s – with the introduction of nalidixic acid to treat urinary tract infections. Quinolones in modern use are fluoroquinolones – examples of which include ciprofloxacin and moxifloxacin. Fluoroquinolones are broad-spectrum antibacterial agents – used to treat a variety of Gram-positive and Gram-negative infections. However, they are most effective at treating infections caused by aerobic, Gram-negative bacteria. Below, we talk about fluoroquinolones pharmacology in more detail; explaining how they work to exert their therapeutic effect. Fluoroquinolones work by interfering with DNA replication. More specifically, fluoroquinolones work by inhibiting DNA gyrase or topoisomerase IV – inhibiting the DNA replication and transcription processes. Earlier quinolones have more activity against topoisomerase II, whereas later generation quinolones have more activity against topoisomerase IV. Later fluoroquinolones – such as levofloxacin and moxifloxacin – also have more activity against Gram-positive organisms compared to earlier quinolones, such as ciprofloxacin. Due to the risk of developing quick resistance, fluoroquinolones are frequently reserved as second and third-line treatment for a wide variety of infections. Fluoroquinolones are associated with their own range of potential side effects. Though fluoroquinolones are associated with the above side effects, they are generally well-tolerated – at least at a comparable rate to other antibacterial classes. That fluoroquinolones should be used with caution in patients with epilepsy or in patients at an increased risk of seizures. That they should be used with caution in patients with either cardiovascular disease or electrolyte disturbances – both of which increase the risk of QT prolongation. Fluoroquinolones should be used with caution in patients taking drugs that can prolong the QT interval – SSRIs, antipsychotics, quinine, macrolide antibacterial drugs and amiodarone. That fluoroquinolones interact with multivalent ions – for example: magnesium or aluminium ions present in antacids or other medicines. They also interact with calcium, iron or zinc-containing products, supplements or medicines – reducing activity of fluoroquinolones. NSAIDs, when taken with fluoroquinolones, increase the risk of seizures. Prednisolone, when taken with fluoroquinolones, increases the risk of tendonitis or tendon rupture. Fluoroquinolones should be used with caution in patients who are still growing or developing – as it increases the risk of arthopathy and other damage to the musculoskeletal system. That ciprofloxacin is contraindicated in patients taking the muscle relaxant, tizanidine – as the combination can lead to significant respiratory depression. Ciprofloxacin is an inhibitor of CYP1A2, the enzyme that metabolises tizanidine. Other drug substrates of CYP1A2 include theophylline, clozapine, methylxanthines and olanzapine. Fluoroquinolones will, despite the ongoing threat of resistance, remain an important drug class in the clinician’s toolkit. Want to learn more fluoroquinolones pharmacology? Register with PharmaFactz today to receive instant access to all the resources you need. In the meantime, take a few moments to join our newsletter (above) to receive all the latest facts direct to your email!